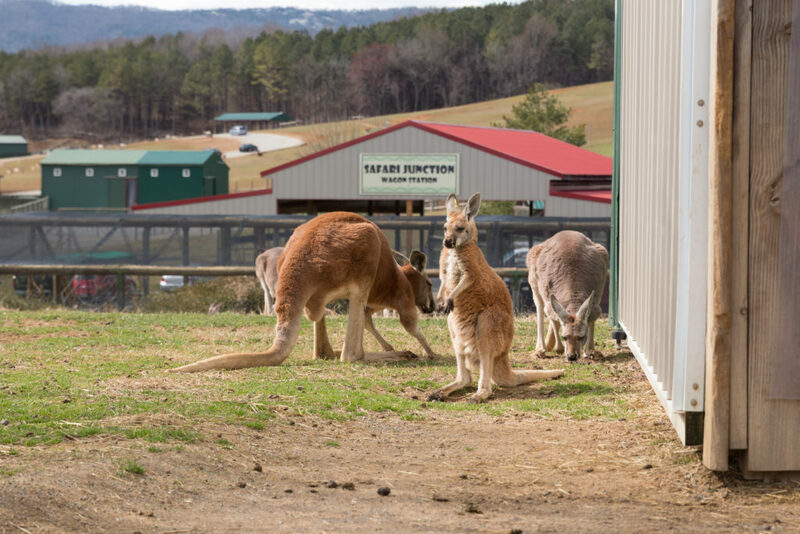 Virginia Safari Park gives you the one-of-a-kind experience to interact with a variety of large and small animals. Not only can you see them, but you can feed them, smell them, and interact with them! We had a nice warm welcome as we entered the safari park. safari entrance. As soon as we rounded the bend giving me a clear view into the safari park, I cracked up laughing. Before we even pulled through the gate, I could see all the animals just standing there on the other side of the cattle guard, staring at us like little kids eagerly waiting at the window for their dad to come home with bags full of candy and treats. Pulling forward through a swarm of potbelly pigs, elk, llamas, deer, and ostriches, they quickly made their way around our vehicle looking for an open window. We drove through the park, stopping every few feet or so to offer our buckets as the animals not-so-gracefully consumed the pellets. 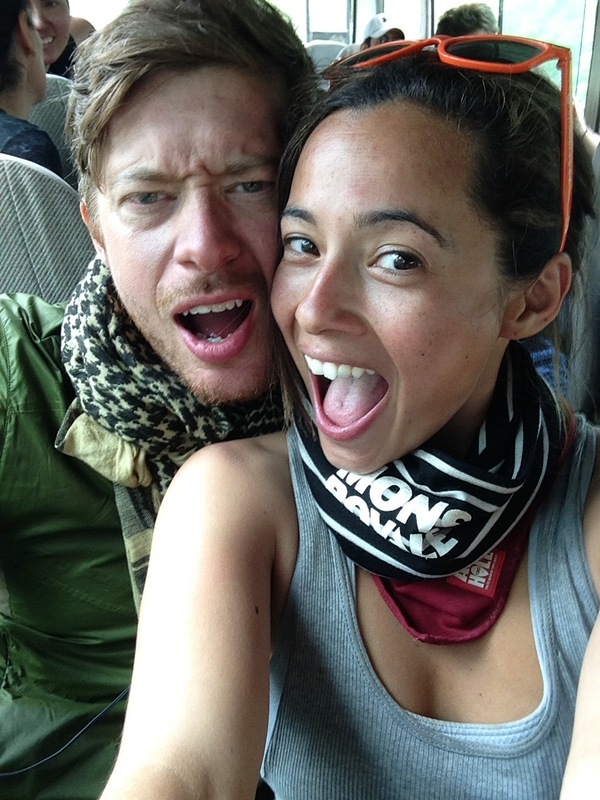 It wasn’t long before we were covered in animal hair and slobber. (It’s ok, we were becoming one with the animals.) 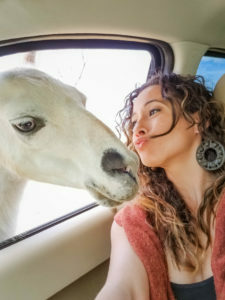 Sometimes a large elk would reach its head into the window and huff into the bucket sending pellet dust all over the car. As we drove along, llamas would literally block our path and stare straight at us through the windshield like some kind of western shown down. I think he was trying to determine who had the bucket of food, the passenger or the driver. Clever thing. visit the zoo as a kid I was always excited to see giraffes, camels, and other big animals, but when it came down to actually seeing them, I had to squint my eyes to try to see anything at all. The animals would be lying down in a shady patch in the far corner or hanging out behind some big rock. There is a difference between seeing wildlife from a distance of 50 feet behind a gate, and seeing them only inches away from my face. When the buffalo came up to my window for food, I could look him in the eyes and hear his huffing breath; when the David’s Deer approached our car, I noticed that his antlers were actually fuzzy, not hard like I had thought. It was such an incredible learning experience and adventure to interact with these animals in this way. As if the drive through interaction wasn’t satisfying enough, Virginia Safari Park also has a small zoo. Among the many animals you might see, are spider monkeys, peacocks, lemurs, wolves, African Penguins and kangaroos. Again, this is probably the closest I have ever seen some of these animals. The tiger cameright up to the window where I was standing so that I could see every detail of his stripes and fur. The kangaroos were hopping around freely only 5 feet in front of me. It was such a fun learning experience to observe these animals at such a close distance. Within the zoo are three other interactive areas. The giraffe feeding area is a raised platform, where you can stand at eye level with the giraffes and feed them little pieces of lettuce. Although we purchased the $1 piece of lettuce, the giraffes wanted to stay on the other side of their enclosure to watch the cars drive through the safari. We didn’t get to feed them this time. And finally, there is the Budgie Aviary, a large enclosed area where 200 or so of these little birds fly around freely. 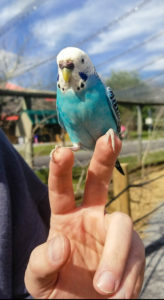 For $1.50, you can purchase a “Budgie stick” and feed them with these seed coated Popsicle sticks. 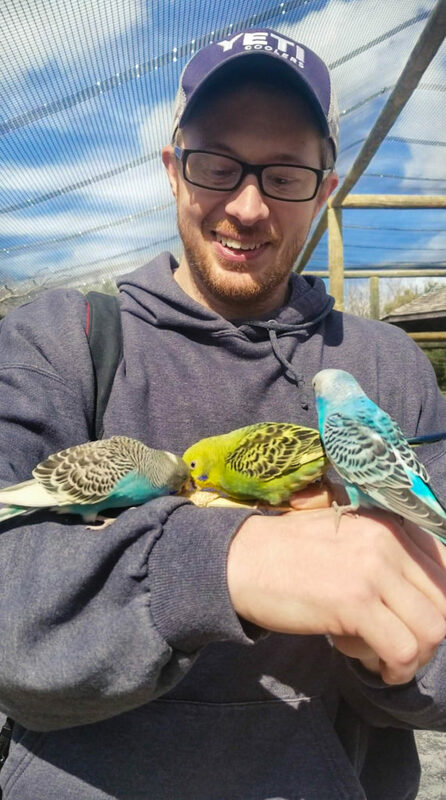 The birds will flock to you and perch on your arm, shoulder, or even your head, as they feed on your Budgie stick. This was surprisingly Scott and I’s favorite part of the entire trip. 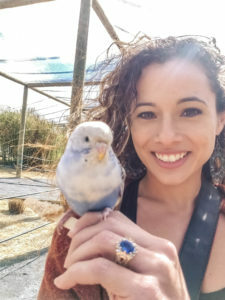 It isn’t every day that you feel like Cinderella with all of nature flocking to you. Arrive early. The entrance is about $22 per adult and $13 per child. This includes ALL-DAY entrance to the safari, the village, and interactive exhibits (excluding animal food.) This means that you can drive through the 3-mile safari as many times as you want! Arrive early and drive through the safari, grab some lunch at the on-site café, explore the “Village” and then go back for another drive. The animals just wander around, so it is likely that you will see something different the next time. Another reason for arriving early in the morning is because the animals will be hungry. If you wait until the late afternoon to arrive, the animals will have already spent the whole day eating and are likely to be less interactive. Get at least one bucket per person. The animals go through them fast, in fact, some sassy animals will try to knock your bucket out of your hand onto the floor. So between how fast the animals eat, and how likely you are to drop your bucket on the ground, just get an extra bucket. They are $4 each at the front gate. Scattering food on the ground will encourage shy animals. 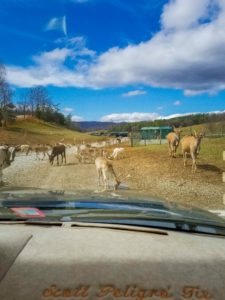 While the ostriches and elk have no problem poking their heads into your vehicle for some food, the baby deer and short potbelly pigs sometimes have trouble competing for food. Sometimes this is because they are a bit hesitant to approach your vehicle, but usually, it is because their tiny legs prevent them from being able to see anything. They just hang out on the ground waiting for some scraps to fall from the bigger guys, so don’t forget to show them some love too. Tossing some food on the ground will encourage shy animals to come closer and give the vertically challenged animals a chance to eat too. Drop off your bucket in the designated area when you leave the safari area. If you’re like me, you are probably thinking, “well I’ll just save some of my food from the safari to feed the animals in the Village area to avoid having to buy another big bucket.” I saved a little bit of food in my bucket with this in mind, however, when we approached the entrance of the Village there was a big sign that read “Do not feed the animals safari food. They have their own special food within the Village.” Indeed, the animals within the Village had a different kind of pellet, so I certainly did not want to cause them harm by feeding them the wrong thing. There are buckets drop-offs when you leave the safari area, and more drop-offs when you leave the park. No point in holding on to them. Call ahead to find out about animal feedings, special events and wagon ride schedules. Within the Village, there are special feedings and demonstrations that you do not want to miss. For $6.50 you can also hitch a ride on a giant wagon that will take you on separate trails throughout the safari park. Your ticket includes a bucket of feed. 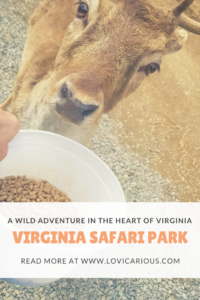 The Virginia Safari Park is just as fun for adults as it is for the kids. To be face to face with a grand bison or a magnificent elk is an amazing experience no matter how old you are. This goes down as one of my favorite animal encounter adventures yet!